All the fighters slated to participate in tomorrow night’s “UFC on FOX: Evans vs. Davis” event tipped the scales Friday at the Chicago Theater in Chicago, Illinois. 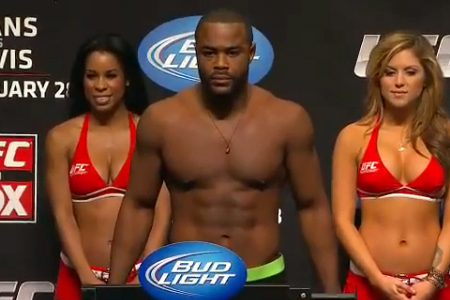 Former light heavyweight champion Rashad Evans (Pictured) faces undefeated Phil Davis in Saturday’s featured attraction. A middleweight top contender shootout between Chael Sonnen and Michael Bisping serves as the co-main event. FOX will broadcast the card’s main bouts live starting at 8PM ET/5PM PT.